‘Flash Sales’, ‘Show of The Month’ offers, discounted tickets, dinner and show offers, London theatre deals, and last minute theatre ticket offers. Simply, enter your email address and we will email you confirmation of your registration. 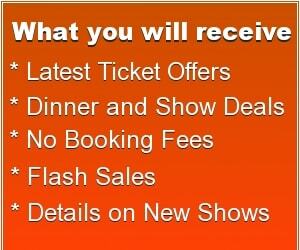 You can look forward to receiving latest ticket offers in your email inbox. You can unsubscribe anytime.